It was an ill-fitting end to a sensational Game 7 that saw Duncan score a Spurs-high 24 points, grab 12 rebounds, snag four steals and dish two assists in 43-plus minutes. Two nights earlier, he'd come out blazing hot with 25 points on 11 for 13 shooting and eight rebounds before halftime of Game 6, only to peter out in the second half and overtime as the Heat surged back to win and force the NBA season's ultimate game. On Thursday, though, Duncan stayed steady throughout, chipping in 11 points and seven rebounds after intermission, teaming with rising sophomore star Kawhi Leonard (19 points, 16 rebounds in Game 7) and Manu Ginobili (18 points, five assists, three rebounds) to keep the Spurs afloat on another night on which Tony Parker just didn't have his game, his shot or his legs (10 points on 3 for 12 shooting, four assists, three steals, zero points in 19 second-half minutes). One year after Parker had vowed to get Duncan back to the Finals, it was Duncan who was dragging his exhausted and wounded point guard to the finish line by making Chris Bosh's life a living hell on both ends of the floor. It was the "Big Fundamental" who became a low-block terror when swarming Miami closeouts and (possibly) the heat of the moment turned record-setting 3-point sharpshooter Danny Green back into a pumpkin in Games 6 and 7. It was the 37-year-old surefire Hall of Famer who answered a huge Shane Battier corner 3-pointer with a conventional 3-point play that was about as unconventional as it gets, tossing a short jumper toward the glass from a razor-thin angle while being bodied by Bosh but still getting the friendly carom because, come on, this is Tim Duncan and a backboard we are talking about. It was Duncan who raced down the court after Battier missed his next triple, sought position on the low block, gave Ginobili a target, felt the 6-foot-8 Battier on his back and immediately turned middle to attack the rim as quickly as possible to tie the game. Though hardly anyone had picked the Spurs to go all the way before the start of the season, or even the start of the playoffs, the championship was close enough for Duncan to taste on Tuesday night, when San Antonio held a five-point lead with 28.2 seconds remaining in Game 6 — when the yellow tape came out to cordon off the court and the Larry O'Brien Trophy was rolled toward courtside in anticipation of the Spurs' coronation. Before all hell broke loose. "To be at this point — with this team, in a situation where people kind of counted us out — [it] is a great accomplishment to be in a Game 7," Duncan said. "Or to be in a Game 6 up one and two chances to win an NBA championship and not do it, that's tough to swallow." 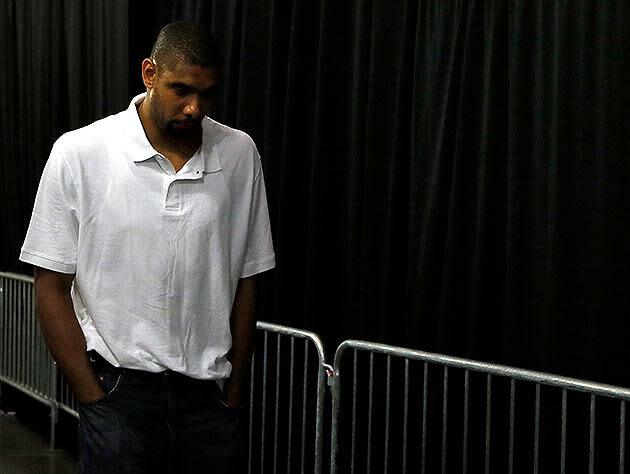 But now that the world has turned and left Duncan here, so close and yet so far away from the fifth title he so desperately craves, the Game 6 meltdown isn't what he'll remember most. "For me, no. Game 7, missing a layup to tie the game," he said in his postgame press conference. "Making a bad decision down the stretch. Just unable to stop Dwyane [Wade] and LeBron [James]. Probably, for me, Game 7 is always going to haunt me."